Marrakech is a city of light and vibrant color. From it’s bustling souks to new museums and art galleries, wide Moroccan restaurants, lavish designer hotels and opulent riad gardens there is something for everyone. There’s no better place to take it all in then one of Marrakech’s fabulous courtyard gardens. Riad courtyard gardens are intimate spaces filled with lush, leafy green flora and fauna often centered around a stone or marble fountain filled with rose petals. In the majority of Moroccan courtyard gardens roses and oranges are grown and in every home courtyard garden a mixture of exotic spices that are brought from Mecca. A Marrakech courtyard garden should be part of a Morocco travelers experience when visiting the city particular in spring and summer. Riad Courtyard gardens serve as the perfect escape to read a book, enjoy a typical Moroccan meal, a sunset cocktail or simply decompress and take in the sights and sounds. Marrakech courtyard gardens offer a divine escape for the Morocco Traveler and for Expats alike. Palais Lamrani is an authentic nineteenth century palace riad with an extraordinary lush garden filled with orange trees, roses bushes, frequent bird visitors an a sense of interior calm. The owners, a remarkable French couple, Noemie and Eric offer a private riad experience for luxury travelers. The Palais has six suites, a swimming pool, a traditional Moroccan Hammam /Spa and terraces that over look the High Atlas Mountains. Riad Enija is owned by a Swedish architect Bjorn Conerdings and Swiss designer Ursula Haldimann. 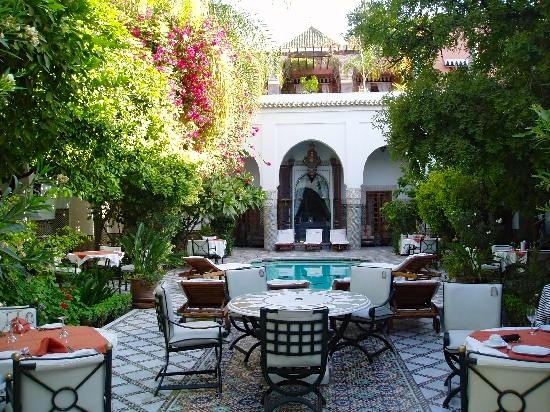 This Maison d’Hotes is made of several riads seemed together with many exotic courtyards and sprawling terraces. Named after their daughter, Enija, it boasts tropical style plants and opulent gardens. Lavish fountains filled with flower petals can be found around every corner during an afternoon stroll. The design of the riad is both sophisticated and eclectic with Ursala having traveled the world collecting textiles, furniture and art all, which have made their way into every room on the property. Ideal for the laid back luxury traveler this riad with secret courtyard gardens guarantees the comfort of a home. 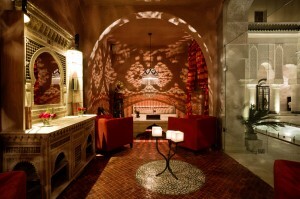 Dar Donab is located in the Dar El Bacha region of the Marrakech medina. This typical Moroccan riad has stunning traditional architecture and quite an intimate setting for a day at leisure. 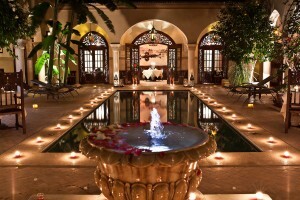 The courtyard at Dar Donab is arranged around a swimming pool and gurgling fountains. Dating from the eighteenth century, this riad was once part of the Dar El Glaoui’s Palace. The courtyard garden remains authentic with its zellij tile work and Andalusian style patio paved with marble. A haven of peace this courtyard garden is perfect for an afternoon cocktail or late lunch just before sunset when the light is at its peak. Palais Sebban located in the popular Moussine district of the Marrakech medina is a hidden jewel of Moroccan-Andalusian architecture. This charming boutique riad has a breathtaking courtyard with a stylized hanging garden dripping from it’s rooftop terrace. Originally constructed around the residence of Caíd Sebban, this nineteenth century palace has three courtyards, hand painted rooftops, frescos carved in plaster and antiques of historic significance can be found in every nook and cranny. Lunch or Dinner in the courtyard of Sebban or even afternoon tea completes a long day after exploring the Marrakech souks. 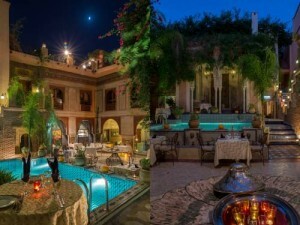 Villa Des Oranges is a stylish Marrakech boutique hotel with a truly romantic courtyard garden perfect for all seasons. A Relais & Chateaux property it is one of the best medina retreat experiences Marrakech has to offer. A French couple, Pascal and Veronique Beherec discovered this riad on a trip to Morocco in 1998 and then began the creation of a luxury this hotel that combines sophistication with luminous textures, fabrics, Moroccan woodwork and further development of the garden. It took nine months to restore the traditional Moroccan house using local artisans in Marrakech. Elegance combined with the cozy essence of a home, salons with fireplaces, private terraces and views of the Atlas are just a few good reasons to stay at Villa Des Orangers. Just a 2 minute walk to the place Djemma El Fna, Villa des Orangers is a veritable oasis of calm. With three green patios and trickling fountains, harmony can be found here. 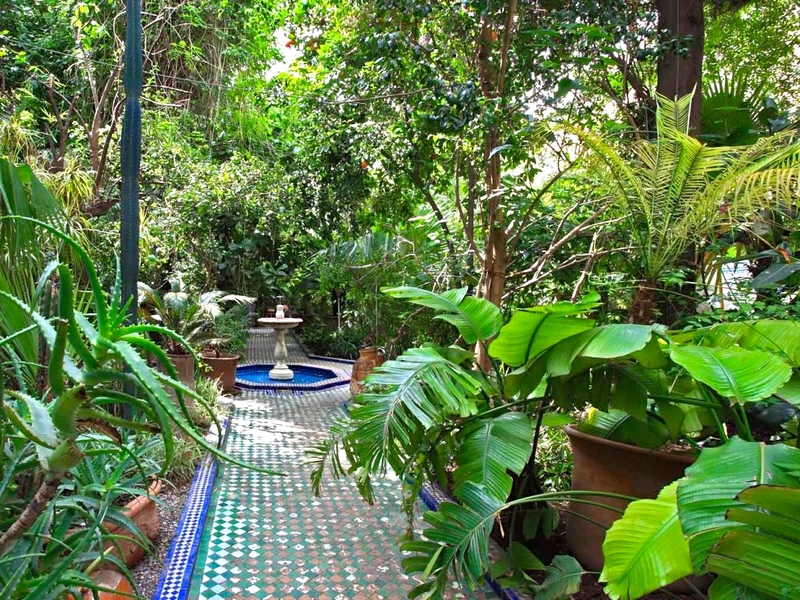 For more information on Marrakech Riads and Courtyard Gardens. Morocco is moderate, Muslim country located in North Africa that is rich in history, steeped in culture, exotic cuisine and natural wonders. When traveling to Morocco there are many luxury hotels to stay at during a Morocco Tour. First in Morocco are its Luxury Riads that offer amenities on par with a luxury hotel. 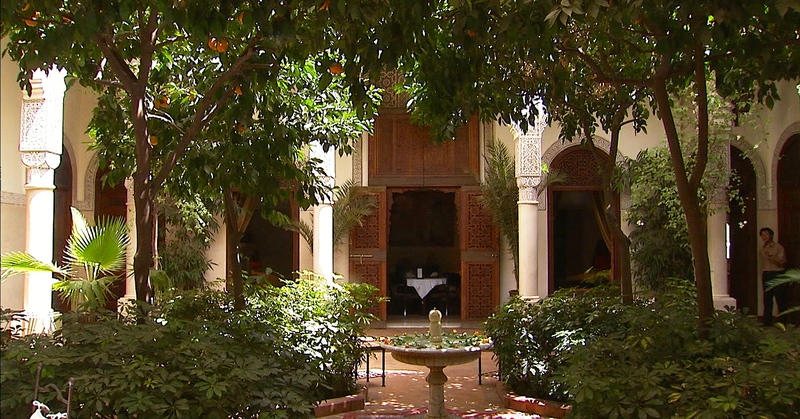 Morocco’s Riads boast beautiful courtyards and incredible architecture. Staying at a luxury Riad in Morocco can offer a top quality experience, equivalent to a luxury hotel. 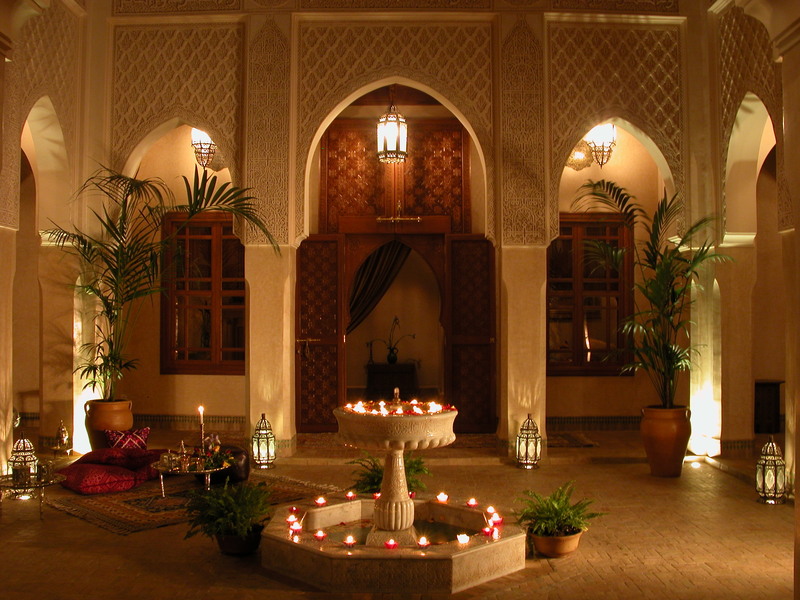 Luxury Hotels in Morocco can be found in all Moroccan Cities and in rural areas of the Moroccan country side. Dating from the 18th century, Riad Kniza is a luxury Riad in Marrakech located in heart of the medina not far from the top Marrakech sites, monuments, mosques and gardens. This top end Riad has traditional Moroccan furniture and décor with luxurious bathrooms and a beautiful roof terrace for evening tea or dining. Riad Kniza offers Wifi and has a host of other amenities including a swimming pool, spa and wellness center. Riad Kniza is an idea place to stay for those interested in an authentic luxury Riad experience and one that is complimented by beautiful architecture and traditional Fes Moroccan fabrics. Les Jardins de la Medina is a stunning luxury Marrakech Riad that combines modern amenities with Modern Moroccan décor. Located in Kasbah, a quiet region of the old Marrakech Medina, Les Jardin boats lush gardens with old palms, orange, olive and jacaranda trees. The food is fresh and service impeccable. This quiet oasis away from the hustle and bustle of Marrakech is the perfect place to stay on a Morocco Tour. Riad Le Sultana is one of Marrakech’s hidden jewels for luxury accommodations. Located near the Saadisn tombs, Sultana is comprised of five separate Riads that have been elegantly pieced together with open-air patios and expansive, charming roof terraces with palms and Marrakech orange trees. Sultana is a sophisticated Riad and has successfully created an ambiance that is serene with it’s tasteful mélange of European décor and furniture complimented by Moroccan fabric and tilework using traditional craftsmanship. 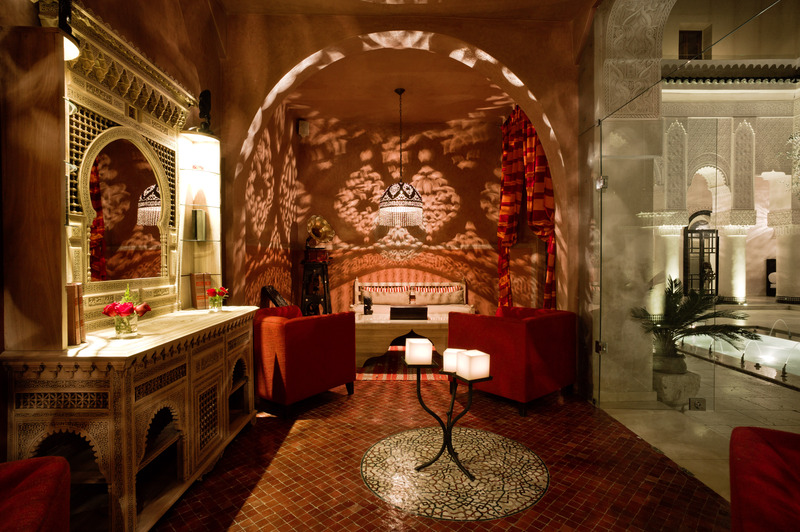 The staff matches the environment offering a perfect lusury Moroccan Riad experience. Riad Fes is in the Medina’s Batha region of Fes. This Riad offers and idea mix of Moroccan traditional architecture with a tasteful and luxurious modern touch. Originally a Moroccan Riad that lacked a modern setting, Riad Fes’ owners set out to expand Riad Fes whereby to offer a unique mix of the traditional with ultra modern. New additions to this luxury Riad in Fes are a swimming pool surrounded by a garden terrace, chic European outdoor furniture and a modern Spa along with a wing of newly designed rooms. Every room in Riad Fes also offers en-suite bathrooms with air conditioning/ heating and a full mini bar. Riad Fes is a 1st category Riad within the luxury offerings in Fes when it comes to living up to the Relais Cheateaux name. Riad Myra is one of the last true architectural gems where guests can stay in Fes. This first class Fassis Riad has stunning Andalusian architecture and a magnificent courtyard surrounded by greenery and an old world fountain. Owned by the Chab family (owners of Al Fassia Restaurants in Marrakech and Bled Al Fassia) Riad Myra is the best remaining example of a traditional, three floor authentic family ryad – home -that was originally restored with care by the best zellij tile masters and top cedar carvers in Fes. Each of Riad Myra’s suites and rooms are ornately arranged with four poster beds, a Moroccan salon and en suite bathrooms along with antique fixtures complimented by modern amenities for complete comfort. Suites and rooms at the Riad are also decorated with traditional French armoires and desks with brass lighting fixtures made for a Queen. Upon arrival guests receive Fes pastries, water and a fruit basket that will last their entire stay. A night or two or even three or four at Riad Myra will take anyone back into a one-thousand-and one-nights 18th Century Arabian fantasy. Riad Myra’s rich, elegant Fassis fabrics used in its dining room, library and luxurious rooms and suites are lush. Riad Myra also has authentic paintings that surround it’s Riad walls and can easily lay claim to offering some of the best cuisine at any Riad in Fes. Myra does it best with their dinner arrangement of original Fes cuisine including a meza of salads, option of chick and lemon or for vegetarians an artichoke tajine with orange canelle with cinnamon for desert. To boot this Riad has an attentive staff that caters to guest needs and a concierge that dresses in traditional Fassis wears with pointy yellow baboosh. For an authentic 1st star experience of luxury comfort and cuisine Riad Myra is the place to stay in Fes. Palais Ferraj is a new luxury Hotel and the first of its kind in Fes. Located in the Bab Ziat district and just a 10 minute walk from the Blue Gate in Fes. When entering Palais Ferraj one is reminded of being in an Arab-Moorish palace. Much of the decor is distinctly modern with fabrics imported from France and Italy. Palais Ferraj has one of the best views in Fes from it’s stunning bar- restaurant and visit for an elegant Moroccan dinner. For those looking to stay in Fes in luxury hotel and not be in the heart of the medina Palais Ferraj offers the best of all worlds. 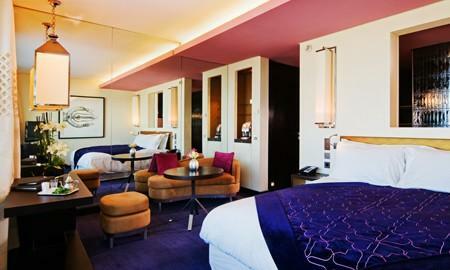 At Palais Ferraj there are no standard rooms as the starting accommodation is a Junior Suite. All Junior Suites and other Suites in this luxury hotel boast Moroccan Zellij tile work, a mini bar, flat-screen TV with satellite channels and private bathrooms fit for the Pacha. At Palais Ferraj you can consider shopping until you drop in Fes as each room also features an impeccably designed closet with space to stay for a week or more. Palais Ferraj also offers an outdoor pool, Moroccan Hammam, Luxury Spa facilities and massage treatments utilizing Morocco’s best rose, argan and other oils. Riad Ksar Ighnda is located jut footsteps from the UENSCO World Heritage site, Ait Benhaddou and 25 minutes from Ouarzazate’s city center. Riad Ksar Ignda overlooks the Atlas Mountains and has terraces views of Ait Benhaddou. This 5 Star Luxury riad offers a modern setting combined with traditional Moroccan architecture and Berber textiles. Ksar Ighnda blends perfectly with the Ouarzazate Sahara region environment. Bedrooms are spacious, with en suite private bathrooms, air conditioning, heating, satellite TV, DVD/ CD player and mini bar. 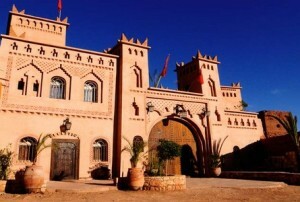 Ksar Ighnda offers meals made with local produce and has a swimming pool and a Moroccan Spa (Hammam) and Jacuzzi. This Riad is the top place to stay in the Ouarzazate region and an ideal spot for those who want to spend a few days down time during a journey in the midst of peace and nature. Temple Des Arts is a 5-star luxury Riad is conveniently located in the heart of Ouarzazate, just 25 minutes from Ait Benhaddou. This uniquely designed Luxury Riad with a film theme decor is on par with a luxury hotel offering standard rooms and suites in a quiet setting with complimentary Wi-Fi and flat-screen TV’s. Hotel Riad Le Temple Des Arts features an outdoor pool, a spa and wellness center along with a traditional Moroccan Hammam. Traditional decor combines unique elements of painted walls with Moroccan tradition, Buddha statues and slick marble bathrooms. Most of the rooms have a balcony that overlooks the garden or swimming pool. Hotel Temple Des Arts offers gourmet meals and is the most suitable Riad in Ouarzazate for those who want luxury amenities in a unique setting yet don’t want to stay at a local Southern Morocco Guest House.
. It’s sister property located in Erfoud offers similar luxuries however lacks the view being it is located in a Sahara Desert town which is referred to as “The Door to the Desert.” Xaluca Dades Valley has African decor, a Moroccan Spa, *Hammam, swimming pool, bar and one of the best buffet’s in the region. Xaluca Dades Valley is set within the Tinerhir provence and is the best place to stay for a wide range of amenities, location and excellent staff service in the region. Sofitel Blanche Casablanca is a new five star luxurious hotel located just foot steps from the train station, the Habous market and the Casablanca Medina. Sofitel Blanche Casablanca is the ideal place to stay during a one-day Casablanca tour or on a visit to Morocco when needing to overnight in Casablanca. The rooms combine luxury modern comforts with Moroccan decor. One of the Sofitel Blancha Casablanca suites has impeccable views of the Hassan II Mosque and boasts glass windows that offer some of the best views in Casablanca. Wifi is available throughout this upscale luxury Moroccan Hotel property and the breakfast buffet is fit for a King and Queen.